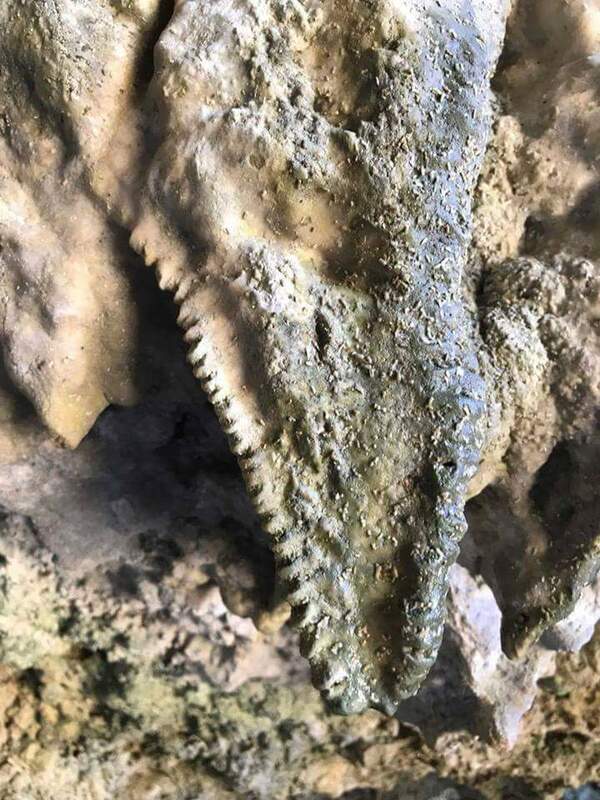 Dinosaur Fossil Has Surfaced in Eastern Samar. 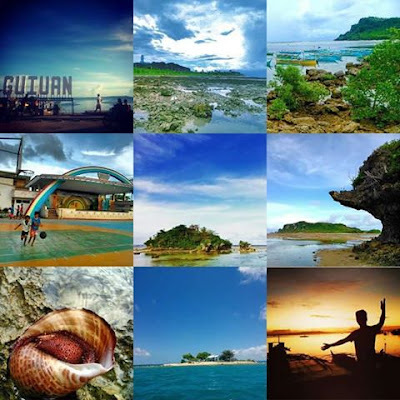  Home  Dinasaur  Dinasour  eastern samar  Fossil  travel  Dinosaur Fossil Has Surfaced in Eastern Samar. A fossilized structure that looks like the mouth-bone part of an ancient dinosaur has surfaced in Eastern Samar. The discovery was brought to my attention through some photos posted in my Facebook message box by Jerald Torillo, my former student (34th batch) at the U.P. Manila School of Health Sciences in Palo, Leyte. A native of Hernani, Eastern Samar, Jerald is now doing return service as recipient of a slot in the Midwifery Scholarship Program in the Philippines (MSPP) of the Department of Health (DOH) at his hometown’s Rural Health Unit. 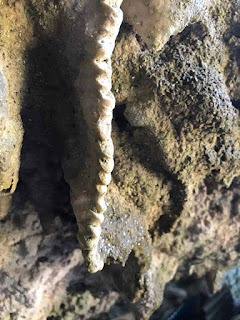 The fossil is embedded on the limestone ceiling of a cave in the Canhugas Nature Park, located near the beach in Brgy. Nagaja, one-half kilometer northeast of the poblacion of Hernani, which is being developed by the municipal government since last year. Jerald said he has bathed in the sea of the area since childhood. But the cave was always a prohibitive place, because it was overgrown with thickets and believed to be the abode of snakes and other harmful creatures. But last month, the cave was cleaned up of debris and vegetation, and the fossil came into view last week. One straight edge of the fossil presents what looks like the serrated teeth of an ancient animal, presumably a dinosaur. A famous earliest live footage of a storm surge brought in by Supertyphoon Yolanda on November 8, 2013 was filmed in Hernani. It showed about four meters of storm surge waters rampaging through the town and destroying buildings and structures along their paths. The subsequent clean up and rehabilitation processes after the disaster seemed to have helped surface this ancient fossil. I am presenting this issue in my Facebook for the consideration of interested experts in the scientific community. Is this find a real fossil? If so, of what animal or dinosaur species does it belong to?